Prepared by: Julian Rode, Heidi Wittmer, Gibran Watfe. Summary: The TEEB guides, developed by the Helmholtz Centre for Environmental Research – UFZ on behalf of the German Agency for Nature Conservation (BfN), focus specifically on three of the co-called ‘Aichi Targets’; a set of 20 biodiversity goals agreed by governments under the CBD in 2010. Aichi Target 11 is increasing the amount and effectively managing land, inland waters and ocean covered by protected areas (Aichi Target 11). 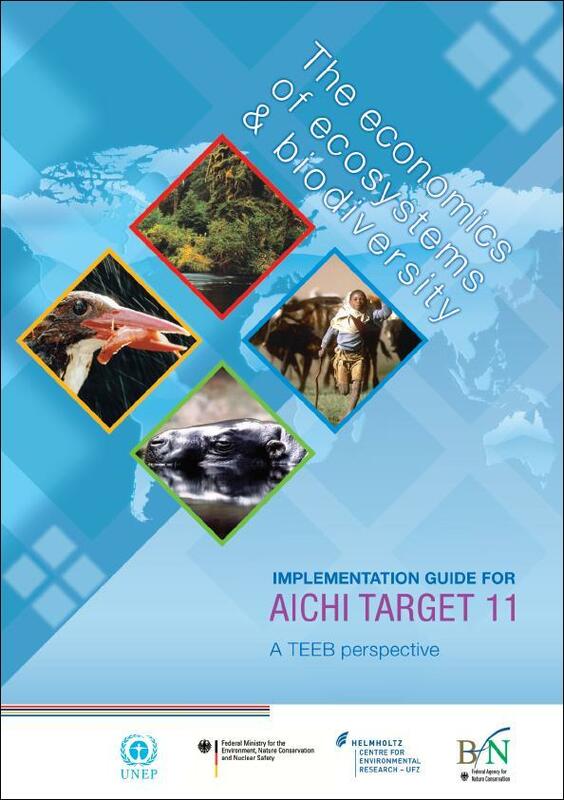 The guides provide practical support for national governments, regional policy-makers, and other groups in making use of the findings of TEEB to support efforts to achieve the Aichi targets by 2020. Citation: Rode, J., Wittmer, H., Watfe, G., 2012, Implementation Guide for Aichi Target 11 – A TEEB perspective. German Federal Agency for Nature Conservation (BfN).